Food isn’t the only element that creates a better eating experience for customers. Local restaurants can create different atmospheres through themed decor. Hilarie Burhans, co-owner of Salaam, said her restaurant serves cuisine from around the world and doesn’t cook cuisines from the Americas. Instead, Salaam serves dishes from countries like Pakistan, Greece and Turkey. Restaurant Salaam, located on W. Washington Street in Athens, Ohio, offers Mediterranean, Middle Eastern and North African cuisine, with the aesthetics to match. Before Salaam, Burhans and her family operated a hookah bar that served Middle Eastern food. They agreed that making global cuisine was the best part of running the first business, so they moved to a better address to start a restaurant. 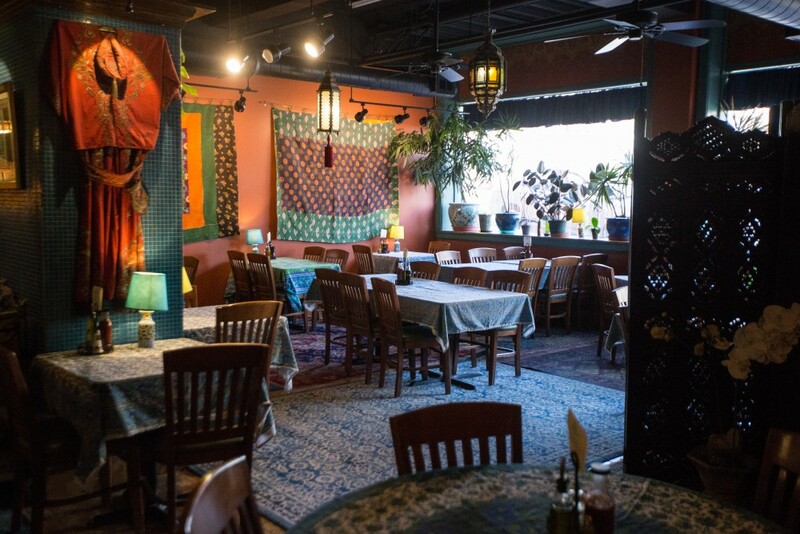 Salaam’s location at 21 W. Washington St. is unusual for Athens because it’s wide, but they put in some walls and decorated nearly every inch of the interior with pieces from ethnic cultures. Jay Shapiro, co-owner of Union Street Diner, 70 W. Union St., said the restaurant has several pictures of Ohio University and its sports games. The collegiate vibe and 24/7 operating hours make the diner a prime option for anyone, especially a younger crowd, wanting traditional American food. Tyler Sampson, owner and chef at 9 Tables, said there aren’t many decent places in Athens to order a multicourse meal in a fine dining atmosphere. “I started it out as somewhere you could sit down and have a seven-course meal because you really can’t get that anywhere else around here,” he said. Sampson took the idea of fine dining and brought it to Athens. 9 Tables is only open Thursday to Saturday from 5 p.m. to midnight. The restaurant offers a five-course meal and a seven-course meal. He wanted 9 Tables to emulate a jazzy vibe with records and antique instruments hanging on the walls. In Salaam, some wall spaces are covered by several hand-stitched ralli quilts, a type of traditional quilt from Pakistan, and suzani needlework, a type of embroidered fabric from Tajikistan. Burhans enjoys finding new additions for her restaurants in odd places, like thrift stores, and even tinkering with them to suit a purpose. A few of her ceiling lamps came from Big Lots, and they were originally candle holders. She added light bulbs and curtain tassels so they could fit the interior. Burhans said Salaam doesn’t have the same clientele as many chain restaurants around Athens. Besides visiting the restaurant for personal celebrations and OU events, students and faculty will also bring people from out of town. “We love that we are on the short list of places that people like to bring someone to show off Athens,” she said.